Shortly after I arrived in Kuala Lumpur in 1991 as newly-appointed bureau chief for the Far Eastern Economic Review I was introduced to a Malaysian journalist then working for the Singapore Straits Times. We worked in a country well known for its disdain for the foreign media; and we were particular targets because our publications were deemed by the government to be biased against or even hostile to Malaysia. Partly because of the common challenges we faced, but perhaps mostly because we enjoyed eating nasi kandar and roti canai at street side stalls in Kuala Lumpur or on the many out-station reporting trips we took together, we became good friends. A quarter of a century later my close friend Kalimullah Hassan is no longer a journalist – neither am I. Our beloved profession has been much affected by the decline of advertising revenues and the rise of social media. But Kali, as all his friends know him, remains as passionate and concerned about his country as he was when we drove for long hours around rural constituencies in out of the way parts of Kedah, Kelantan and Terengganu covering by-elections. So when I read ‘The Malaysia That Could Be’, his newly published collection of columns and recollections, many of those earnest discussions and arguments we had over steaming cups of teh tarik in the 1990s came flooding back to me. There is his great pride in Malaysia’s ethnic diversity, his deep concern about the divisive racist rhetoric of contested politics and the corrosive impact of patronage and corruption in high places. Like many of us who have lived or worked in Malaysia, whether we are Malaysian or not, what we see today is a nation once proud of its institutional integrity and ethnic diversity, now threatened by a deterioration of the probity and quality of governance and sharply polarized communal tendencies. For Kali, the country is on a slippery slope. “Intolerance is growing and there is no firm guiding hand, no leadership to lead us back to the right path,” he writes in the introduction. In a bitter post-script to this collection of columns he wrote for The New Straits Times when he was Group Editor from 2004-7, he bemoans the erosion of ethnic and religious tolerance and the rise of chauvinistic right wing politicians who have replaced the narrative of renewal and reform with the rhetoric of bigotry and racism. How right he is that ‘if you want to see Malaysia as Malaysia is and as it should be’, then celebrating the Harvest Festival in Sabah is exactly the place to be. The postscript to the book is where Kali’s expresses deep disappointment and where he falls victim perhaps to bitterness that is sometimes hard to read. Like Kali I was extremely optimistic about Malaysia during the years when Abdullah Badawi was Prime Minister. As much as Mahathir Mohamad helped develop and modernise Malaysia, he was a complex, uncompromising man with deeply ingrained prejudices that made it hard to feel welcome as a foreigner, or safe as a journalist. Abdullah was a charming breath of fresh air, a man of high moral caliber and moderate views. As Kali notes, his long years in the political wilderness left him neither bitter nor vindictive. When he was thrust into power after Mahathir’s surprise resignation in 2003, Abdullah set about the uphill task of restoring institutional integrity and dignity to the office of Prime Minister and was genuinely committed to reform and renewal. I was drawn to him and his fresh faced, well educated advisors. Abdullah and his inner circle, which included Kali, made you feel there was hope for a democratic Malaysia. He was indeed “a decent man… who tried, in his own way, to make the country a more decent place to live in”. But as Kali reveals, there was tremendous pressure on Abdullah to move in the other direction, not least because instead of going quietly into retirement, Mahathir was critical of his successor, whom he considered weak and ineffective. Being a civilized man of polite moderation, it is true that Abdullah lacked the venom and spite to effectively emasculate his opponents. Kali documents incidents he was witness to where Abdullah refused to use his executive power to influence the courts, or bridle the media. On taking office he told the judges, as Kali wrote at the time: ‘that they must preserve the independence of the judiciary and act without fear and favour.’ These affectionately crafted vignettes are among the most valuable in the book, as Abdullah’s premiership is not widely written about. ‘The Malaysia That Could Be’ was published privately in Malaysia in March and sold out within weeks of its initial print run with all the proceeds donated to charity. 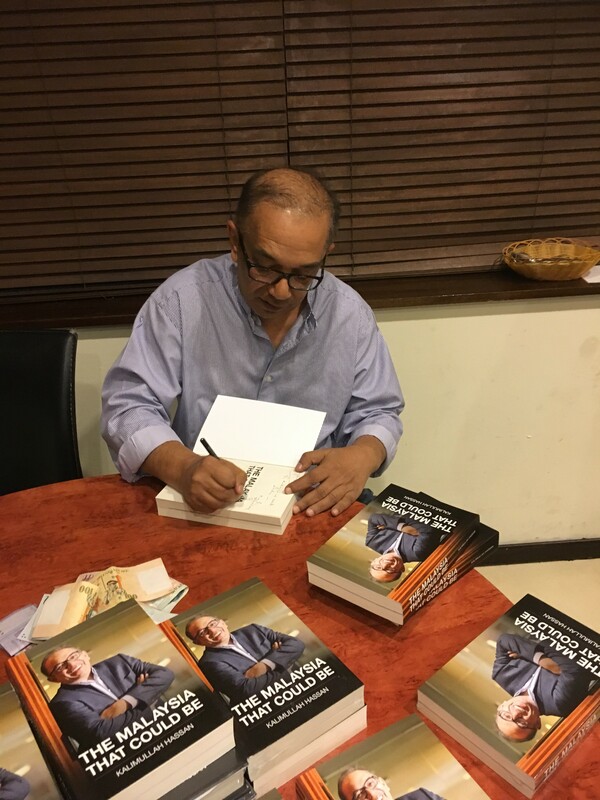 Copies of the book are available from the author.